There are some illustrations that are so integral to my memory of books I read as a kid that to say the name of a book calls them immediately to mind. 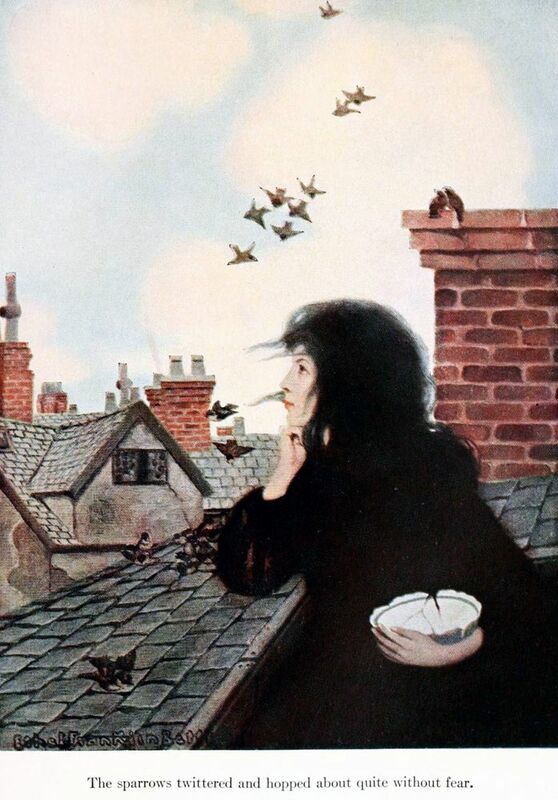 Say “A Little Princess” and I think of Sara Crewe, pale little face framed by a cloud of dark hair, sitting disconsolate in her wretched attic, or a little more optimistically, of Sara, cracked bowl in hand, looking dreamily out over the London rooftops. 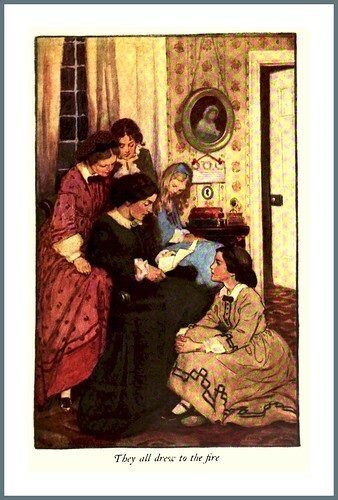 Both illustrations are from an edition of A Little Princess I did not own–we had it in my classroom in 4th grade. I had the more prosaic Tasha Tudor edition at home (if the Tudor illustrations define your Sara Crewe, pardon my partiality) but for some reason these are the illustrations that hooked into my heart. 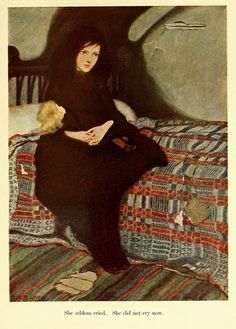 They are by Ethel Franklin Bett, and one of the things I love is that they capture Sara’s oddness–from the beginning of the book Frances Hodgson Burnett describes Sara as odd, “queer”, a serious little girl unlike the pink-and-white Victorian girls who populate her boarding school. I didn’t own the edition of Eight Cousins that captured my imagination, either–the one with pictures by Clara Burd, a “Golden Age” illustrator who was known for her round-faced cherubic children. 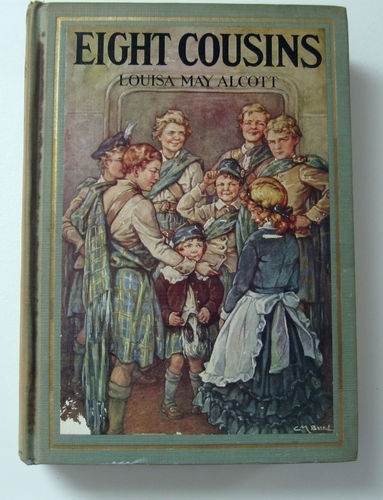 I read Eight Cousins at school, then that edition was lost to me, and on subsequent readings I had to make do with the Little, Brown edition with illustrations by Hattie Longstreet Price, and I came to be fond of those illustrations too. Just so you don’t think I am too inflexible. I love the focus of the girls on their father’s letter, and how…motherly Marmee looks (I have issues with Marmee, but I love this painting nonetheless). 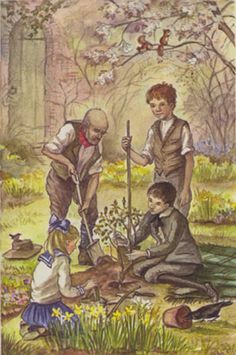 Not all the pictures I love from books I read and re-read as a kid are full color, or painted by Edwardian ladies with three names. 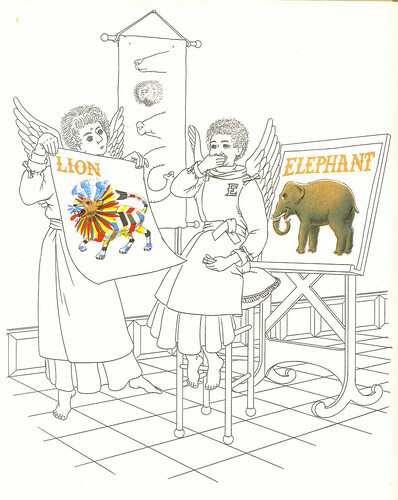 When I was small, one of the books I adored was Lion, by William Pené duBois. In it, one of the Great Designer’s sub-designer angels comes up with a great name for a new animal: Lion. He has some problems in the design phase, however, and goes from angel to angel getting feedback. It’s only when he edits his idea that Lion becomes more recognizable as the animal we know today. Here’s our angel in an early design phase, getting feedback from another designer who can barely contain his amusement. 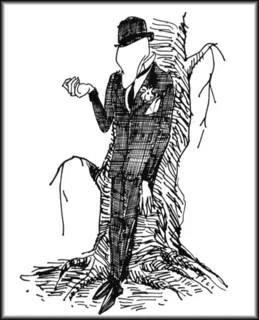 And I love eccentric black and white sketches, and you really don’t get more eccentric than Jules Feiffer’s art for The Phantom Tollbooth. It’s a book that relies heavily on words and wordplay, yet I give Feiffer fully half the credit for the world and the characters that I love in that book. I mean really, isn’t this a Humbug? And I have to confess that the Terrible Trivium gave me nightmares–that combination of urbanity and blankness just got to me. Milo and Tock and Rhyme and Reason and the Mathemagician and Short Shrift, each captured gorgeously in living black and white. Finally, I don’t want anyone to think that I don’t love Tasha Tudor. Her Mary Lennox is my Mary Lennox–accept no substitutes!–and her Colin and Ben and Dickon and Martha look, in my head, exactly as Tudor shows them. I am a creature of words. I can doodle, but I can’t draw, and I tend to want words to draw and define my characters. But when a picture creeps in and gets identified with a work, I can’t fight it. How about you? What illustrations are the books or characters you love? For myself, it was John Rea Neill’s illustrations for the follow-ons to the Wizard of Oz that I remember best. I loved Jack Pumpkin Head but the Raggedy Man made me wary of him. My Mother and her sister got a new one for Christmas for years. They have been handed down complete with my Aunt’s crayon colorings of the drab black & white illustrations. I didn’t much like the William Denslow illustration for the first book, too cute. I thought that the Alice in Wonderland illustrations were a bit depressing. I liked the Mad Hatter and the Cheshire Cat the best. I have always liked clean lines and inked drawings so Charles Gibson’s iconic illustrations of the confident, aloof turn of the century women were intriguing. I can’t speak to particular books at this point but I finally found out that Charles Rackham did many of my favorite illustrations. In a similar vein, N. C. Wyeth, Fredric Remington, Jeff Jones, Frank Frazetta’s Conan’s pyramid of the too slow, Willy Ley’s space campaigning, Gregory Manchess’s John Carter illos, John Berkey’s spaceships, Freff’s Amber interiors, and a host of others illustrated the covers and interiors of the books I devoured. Of Thomas Nast, his Santa Claus portraits, the Boss Tweed caricatures (especially “Twas Him”) made me smile even though I didn’t always understand what was going on in them. I love Wyeth and Remington–that whole tipped-in color plate era of children’s books illustrations are wonderful. And (it now occurs to me) Hilary Knight’s Mrs. Piggle Wiggle and Eloise illustrations, and N.M. Bodecker who did the illustrations for the Edward Eager books, should all have been in my original essay.